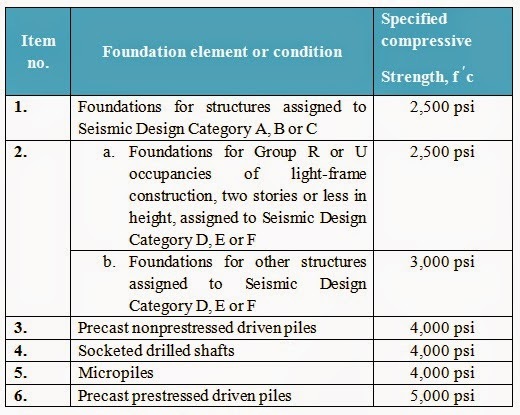 Dear reader in our previous posts we have provided information about concrete strength for foundation and piling work according to different code. Here we will learn about IBC requirement for this foundation construction materials. When concrete is poured in deep foundation special requirement for workability is important. We know in deep foundation like piling work, one of the most popular pouring techniques is through funnel hopper. Concrete poured through funnel hopper from top of foundation element, should be proportioned such that proper cohesiveness of the mix is achieved. The minimum slump recommended as per IBC is 102mm equivalent to 4 inches. There have also a maximum limit too, that is less than 204mm equivalent 8 inch. In some cases grout has to pump; the mix should be designed to have pumpable workability. Dear reader we already have discussed about pumpable concrete mix. DES: In deep foundation like piling work, one of the most popular concrete pouring techniques is through funnel hopper. Did not see any info on grout strength! was looking for a thumb-rule for grout strength based on concrete's.